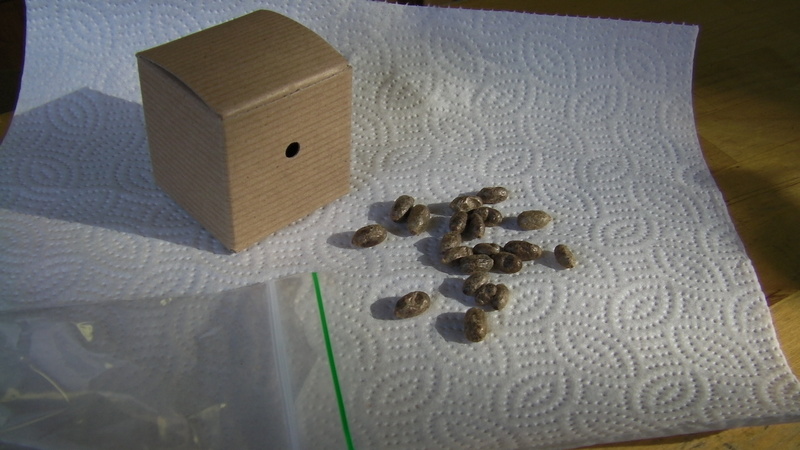 Launch box complete with about 100 cocoons. 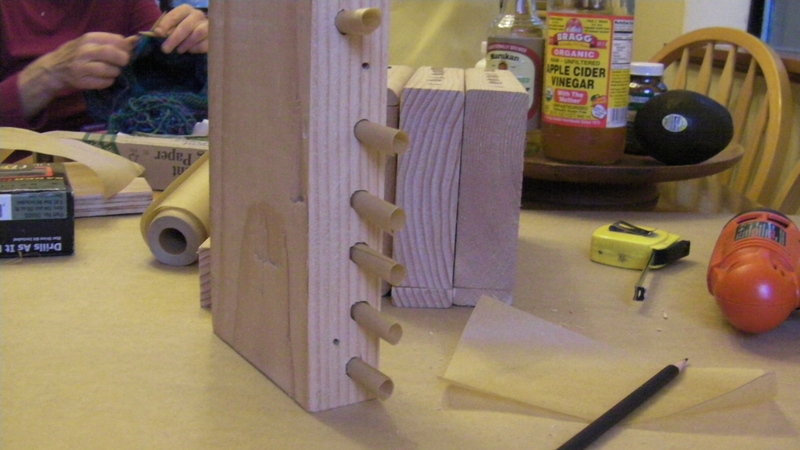 March 6, 2014…first set of Mason bee blocks set up on new shelf. March 30, 2014…We have lift-off. After 24 days of anxious waiting, we see a bee emerge. HB says this is a male. You can see a little yellow fuzz on the face and it has long antenna. I’m soooo relieved to see bees, because after pulling them out of their tubes last year, I wondered if I had handled them too roughly. March 30, 2014…I’m guessing this is a male mason bee. (“Not so fast, Pat”. HB says this is a FEMALE) The males live but a few days. After they mate with the female, they die. A female has already chosen her first tube. Carolyn Prola, author and historian who lives in Myrtle Point, Oregon, shows off her Mason bees. Her bees are ahead of mine by a week or two. 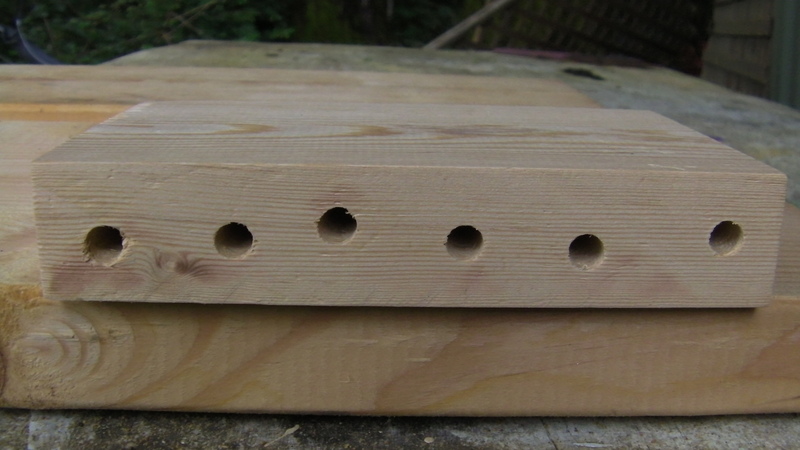 Carolyn is responsible for getting me back into Mason bees after a couple of false starts. March 23, 2013…mounted on solar wall awaiting the hatching. Home made wooden nesting boxes on bottom, purchased plastic box on top. 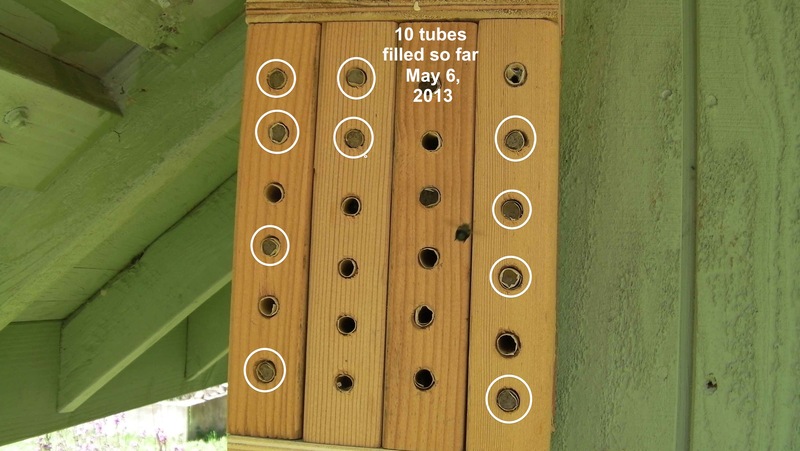 May 6, 2013…10 tubes filled so far. 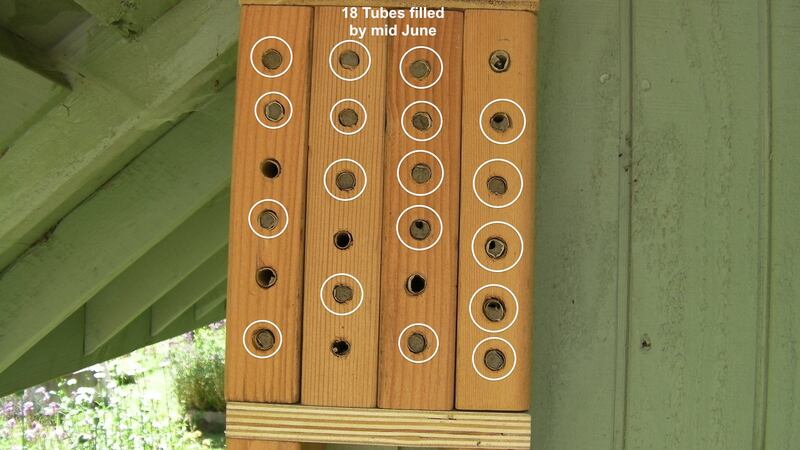 Mid June…18 Tubes are filled. It looks like some predation is taking place, I should move them carefully to the house, standing them in the same orientation so they can finish their metamorphisis. 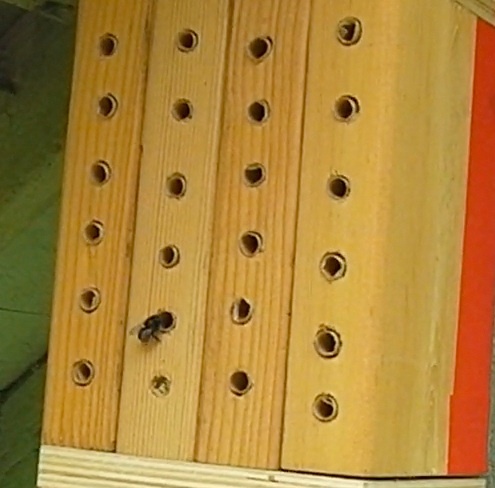 Mason bees are solitary bees but they also prefer to live close to each other. The females each nest in their own tubes and do not help each other. They only raise one generation a year. The life cycle of a Mason bee according to Our Native Bees, A day or two after mating the females begin searching for new nest sites, such as insect holes bored in wood, plant canes, gaps in siding, masonry weep holes and, of course, Plan Bee Houses, if they’re lucky enough to find one! Each female constructs her own brood cells using mud (Orchard Mason Bees) or leaf pieces (Leafcutter Bees) to partition each brood cell. She forages for pollen and nectar, and makes a pollen-nectar loaf upon which she deposits one egg. 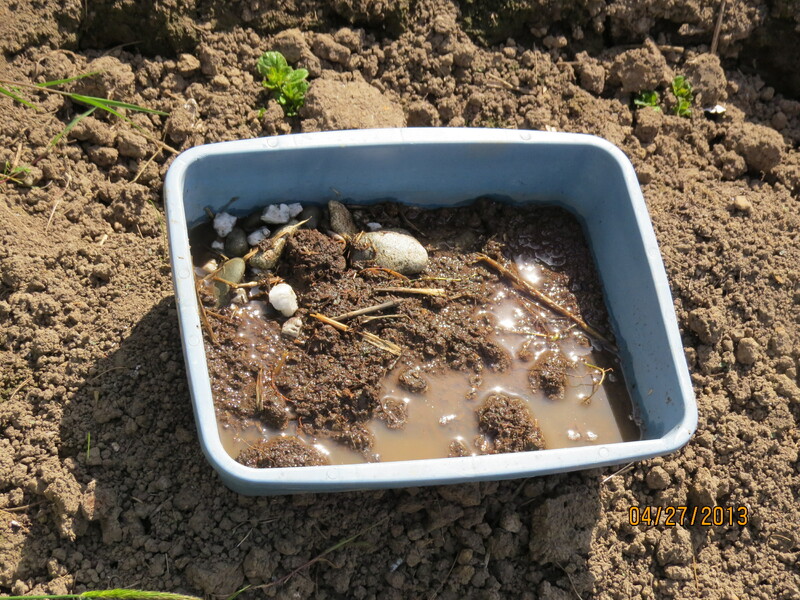 She then seals the cell with either mud or leaf pieces, and begins the process again, normally making 6 – 7 brood cells in a 6″ deep hole or nesting straw. About one week later the eggs hatch and the larvae feed until they’ve eaten all their food supply, which takes approximately six weeks. 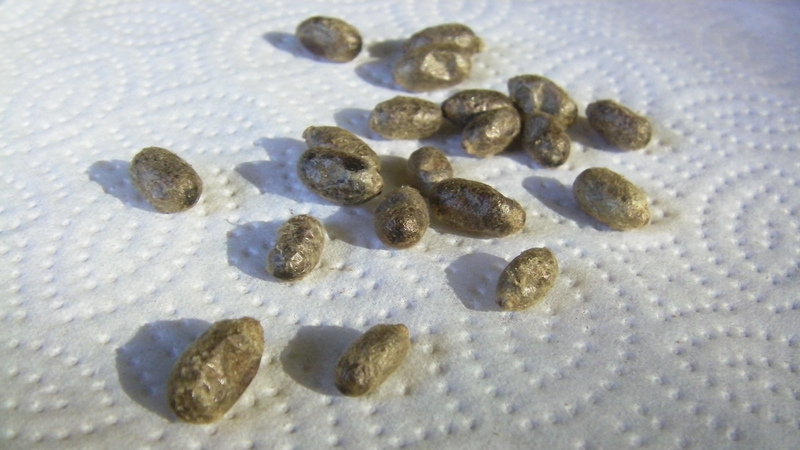 By late June the larvae spin cocoons around themselves and have developed into pupae, or fully-formed adult bees, by late summer. From September to April they remain dormant in a state of ‘diapause’ until the warm spring temps awaken them and the amazing cycle repeats itself. By comparison, honeybee worker development is 21 days, egg to adult. Females decide whether to lay a female or male egg. A female lays about three to four male eggs for every two females because males emerge from the nest first and are more likely to end up as dinner for a predator. Since the males have no other job except to fertilize the females, they stick around the entry waiting for a female to emerge. It takes the female about 15 to 35 trips — with 75 flower visits per trip — to collect enough pollen and nectar to feed one larva. She lays approximately 30 eggs in her lifetime. 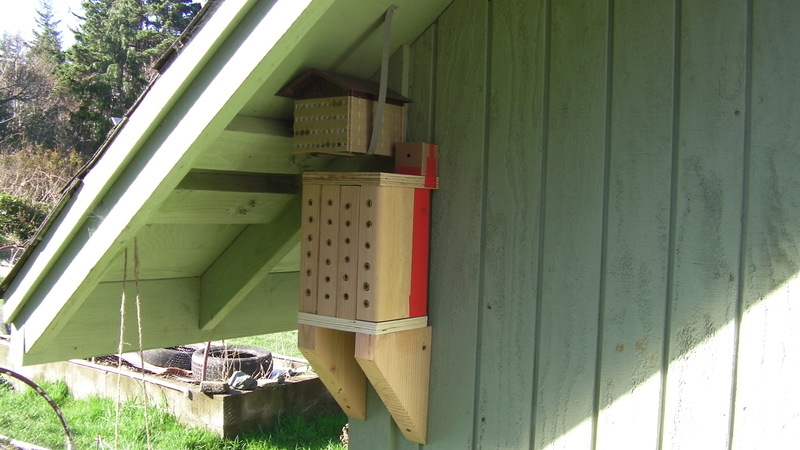 Keeping mason bees is one of the easiest method of beekeeping. What is so amazing about them? 200 mason bees will out-pollinate 2000 honey bees, they will fly at cooler temperatures than honeybees, and rain doesn’t bother them. 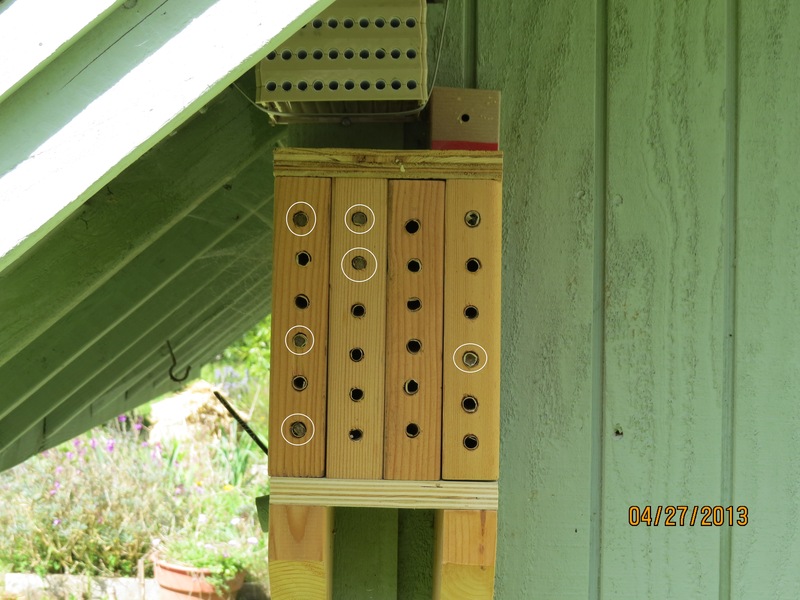 Mason bees rarely sting. How do Mason bees pollinate so well? Their pollen is gathered ‘dry’ on the underside of their abdomen. It’s more easily transferred than the wet pollen of the honeybee. It’s November now. The adult bee is fully formed and it’s the time of year to inspect for Chaetodactylus mites, (not Varroa mites, common on honeybees). Some people advise to wash the cocoons in a sieve with warm water. I hesitate to do that, it seems like it might be too rough. I opt to unroll the tube and gently brush off the debris. November 17, 2013…we pull out a tube to inspect for mites. November 17, 2013…adults are inside these cocoons. Mud partitions clearly visible. 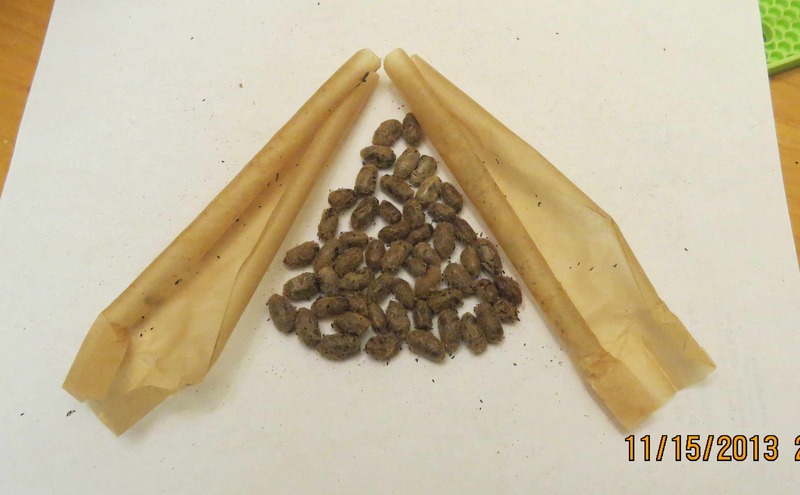 Parchment tubes frame the cocoons which have been brushed clean, no mites seen. 108 adults this year. 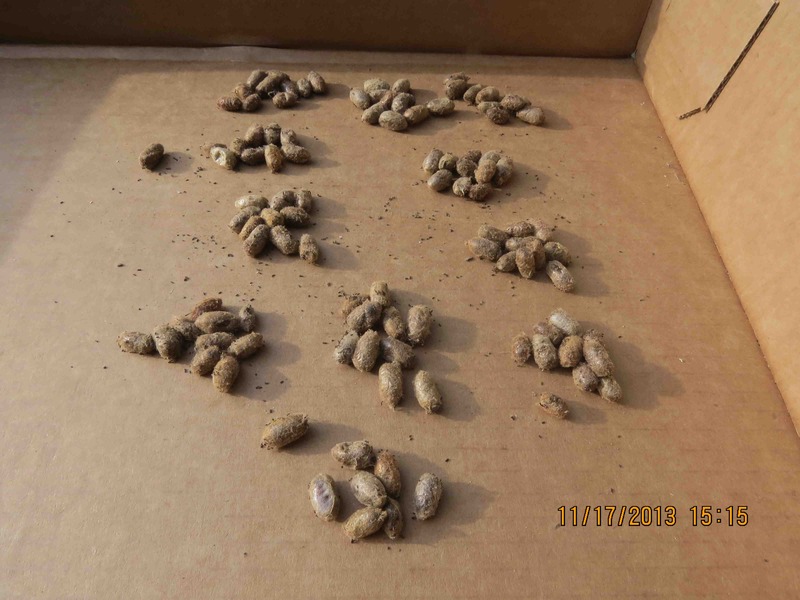 They look good as compared to last year when we didn’t inspect until just prior to putting out the cocoons in late March. 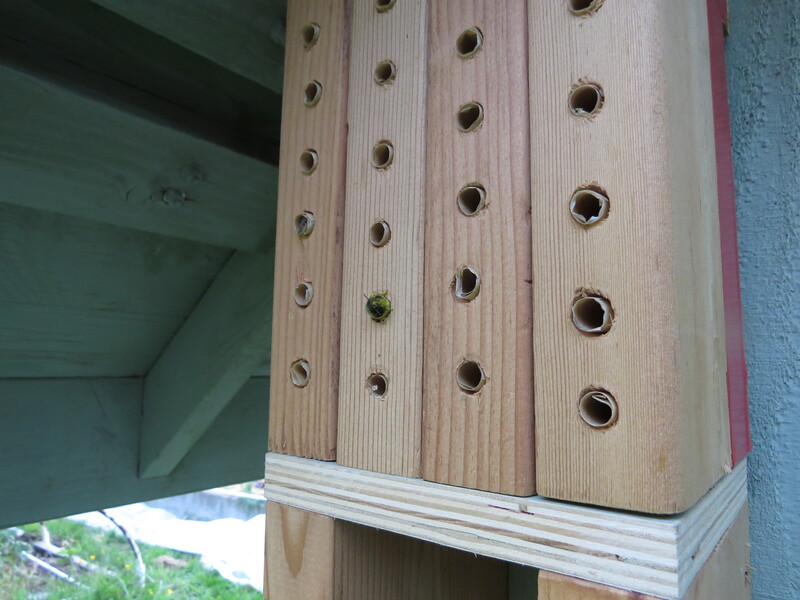 We have found in this moist area, the bees seem to prefer the wood nesting blocks as opposed to plastic homes. 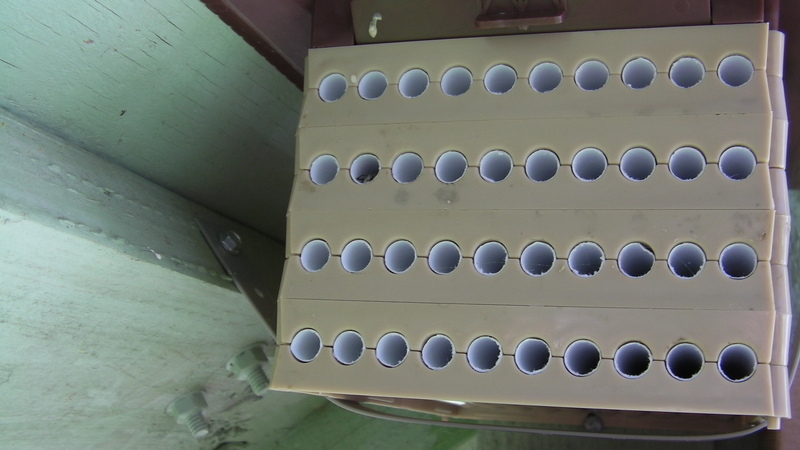 They nested in 21 holes and only one in the plastic box. Last year when I only used the plastic box there was mold in the tubes. I’m not sure if it was due to the plastic or the length of time that I waited. 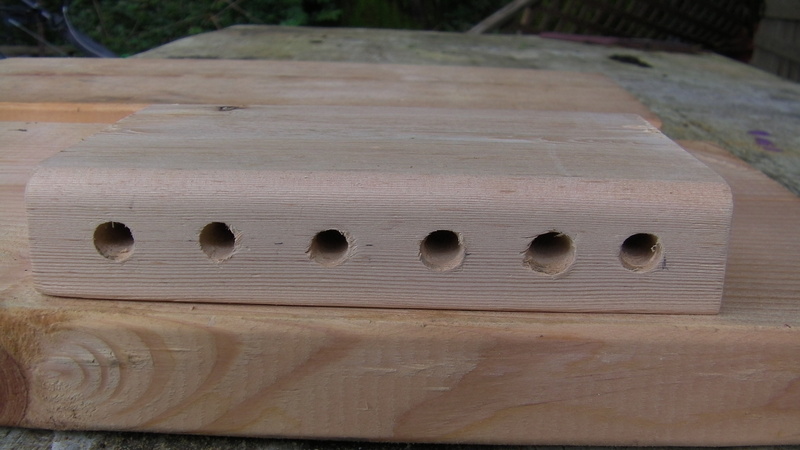 The start of the Mason bees this year. What is This Mason Bee doing? I check the bees occasionally, but usually at this time of night, they are all tucked into their nest tubes, so it was surprising to me to see this pollen covered bee sticking out. Does anyone know what’s going on? I shot this short video so you could see what I’m talking about. I saw some great plans on Dave’s Bees on how to build the nests so I got started yesterday. I hope the bees don’t have a measuring tape…someone can’t drill straight! 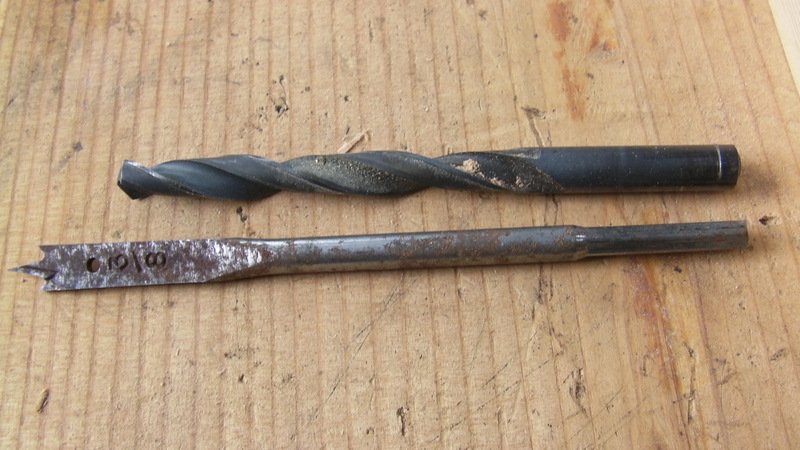 I didn’t want to buy a longer bit, so I started with the top one and ended with the blade bit. Don’t start with the blade type…it’ll take forever to drill. The rolled up parchment paper liners are sticking out. 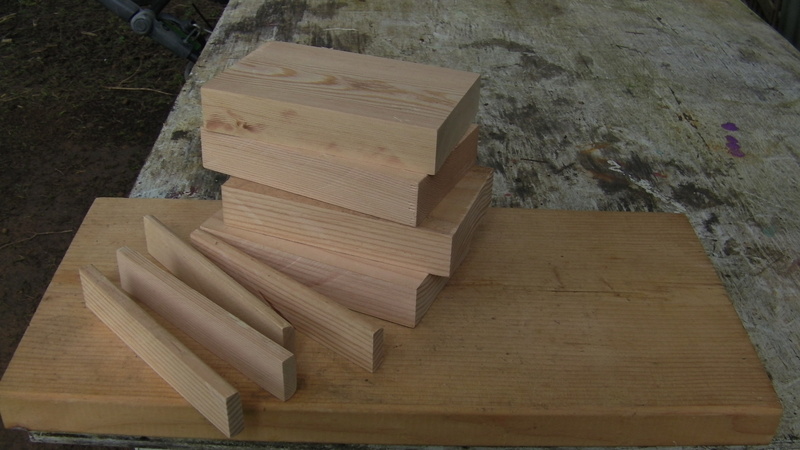 They will be bent flat when the 1/2″ piece of sawed-off wood is fastened back on to seal it off. See Dave’s Bees excellent video. 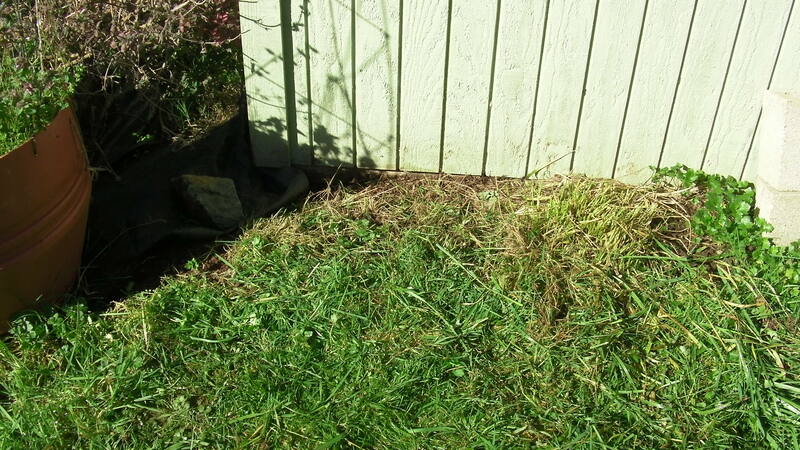 Grass trimmed under nests to make bees more visible if they fall below. The drones (males) will emerge first and wait for the females. Sometimes the females will emerge and fall to the ground. 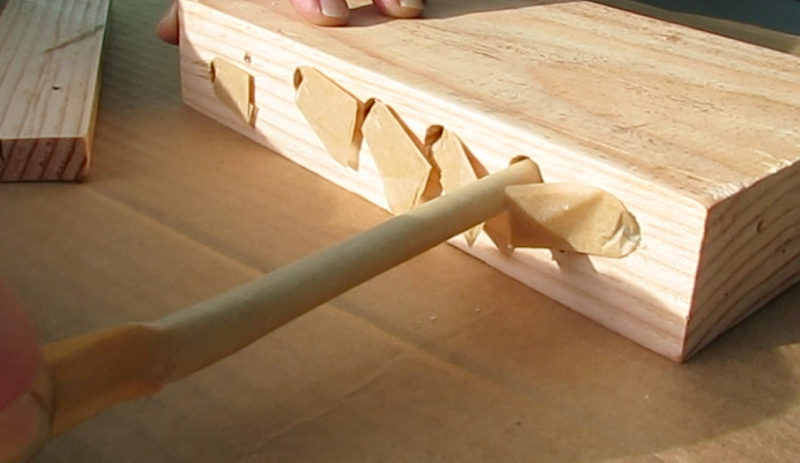 Keeping mason bees is one of the easiest method of beekeeping. Some interesting facts…200 mason bees will outpollinate 2000 honey bees. Mason bees rarely sting. A female Orchard Mason Bee visits more than 1,600 blossoms per day for about 45 days! Will fly in temperatures as low as 50 F. (10 C), and is not bothered by rain. Mason Mud tray. Since the Masons use mud to close up their tubes, it’s recommended that you provide a nearby source of mud. Mason bee update…looking for mites.